Zatar is an amazingly versatile Spice mix ,that tastes tangy ,nutty and herby ,making it one of the favorite condiments in Arab cuisine. The spice mix includes dried thyme, marjoram, oregano, sesame, salt and sumac. The aroma of zatar on fresh baked bread is simply indescribable. To get the best taste ,many in middle east make this spice from scratch. For those of us who can't find the individual ingredients to make the mix ,the middle eastern stores are usually well stocked to purchase this spice mix. These zesty zatar rolls are perfect for brunch or an evening snack. I adapted the following recipe from Zainab's recipe ,which uses multigrains for a more hearty texture and also has feta cheese sprinkle along with the zatar. I made her recipe simpler by using single whole grain and just zatar stuffing. Shape the dough in to a rectangle and sprinkle the Zatar mixture all over ,roll and cut in about 2 inches portion,lay on baking sheet. 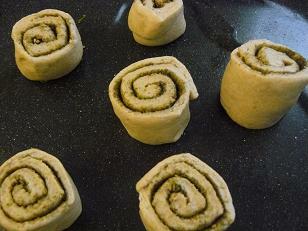 Keep distance between the rolls,cover and let rise for another 45minutes . Place in the middle rack of the oven and bake for 25-30 minutes until lightly browned. Serve warm with any dip. 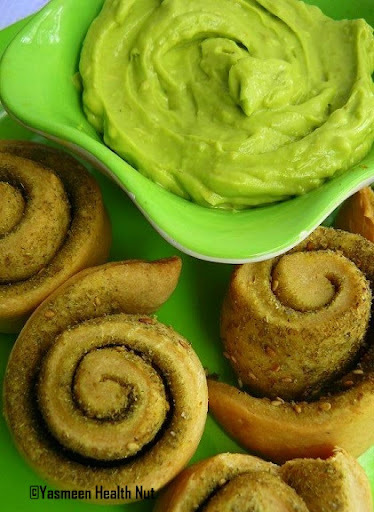 Here I prepared a simple avocado and sour cream dip. Wonderful rolls! Za'atar is a great spice mix. I have never tried Zatar and would love to cook with this spice blend . Share the recipe with exact proportions if you make it. I have fresh oregano growing at home. bioten - This is truly fantastic, supportive and informative blog. I like it. Thanks for sharing information. Yasmeen, I have never tasted zaatar. Your description makes me want to try it inshallah. The dip looks delicious too. How long does it stay good, please share your recipe for it. Jazakallahu Khair. The spice mix makes my mouth water. Wonderful! Yasmeen , havent been here in a long time , definitely missed a lot of goodness, rolls look delicious ! hello Roha! you have nice space out here..i love ur zatar rolls.I live in Kuwait and i get to eat zatar in every form be it bread,toast,drinks and even as chips!..I have home grown zatar as well..
Man I?m impressed with this informative blog, and in fact you hav a genius mind. keep up the good work. Been really long since I visited your space. Delicious rolls and it will perfect for a summery picnic. I am a huge fan already, man. You have done a brilliant job making sure that people understand where you are coming from. And let me tell you, I get it. Great stuff and I cant wait to read more of your blogs. nyc post do you wanna learn about asian rhinoplasty just click on it.. Brilliant one. Za'atar is truly an interesting spice mix. Za'atar croissants are also so lovely in flavour. New to your space and glad to follow ! I like that these use whole wheat pastry flour. I find it works better than whole wheat flour in baked goods. Lovely pictures, mouthwatering rolls! Yummy! snack i wish to have one right now. tasty and healthy! my kids will love these! I am feeling its taste.n It is really interesting to enjoy this rolls as snack. I will try out as soon. 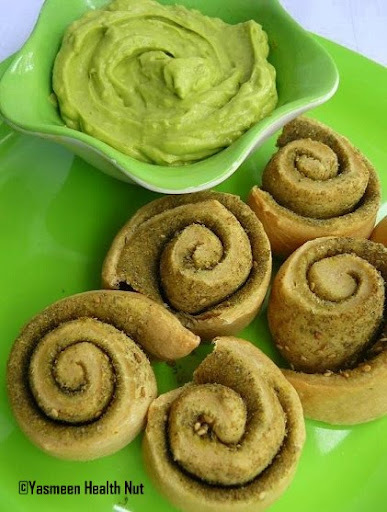 These looks amazing- as does the avocado dip! I just found and bought some zatar...i was so excited when i found it, and now i am dying to use it. making these would be my chance! thank you! do you put olive oil in the zatar? They look so delicious surely gonna try them yesterday and will let you know my reviews.